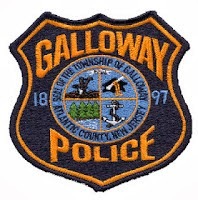 On April 13, 2014 at 8:56 p.m., the Galloway Township Police Department responded to a Motor Vehicle accident involving an overturned vehicle with possible entrapment on New York Road (US Route 9) by Chanese Lane. According to Police a 2004 Buick Ranier, operated by Paul Zavocki of Toms River, NJ, made a left turn out of the gas station onto northbound US Route 9. As the Buick entered the roadway it was rear ended by a northbound 2013 Toyota Camry, operated by Ann Rapisardi of Little Egg Harbor, NJ. The impact caused the Toyota to overturn. The driver of the Toyota, and her passenger, David Rapisardi, had to be extricated from the vehicle by the Galloway Township Fire Department. Both were taken to Atlanticare Regional Medical Center - Mainland Division for head and chest injuries. The driver of the Buick and the passenger, Alice Zavocki, complained of chest pain and were treated at the scene. The driver of the Buick was issued a summons for careless driving. The accident is being investigated by Officer Paul Smith.